Cool, compact, and incredibly useful. Update: The Apple Watch Powerbank by Zens is now available at the Watch Store with free shipping! Most external batteries for the Apple Watch are BYOC — Bring Your Own Cable — and have bulky winding systems for tucking the cable away. Not the compact Apple Watch Powerbank from Zens, perhaps the most portable external battery pack on the market. 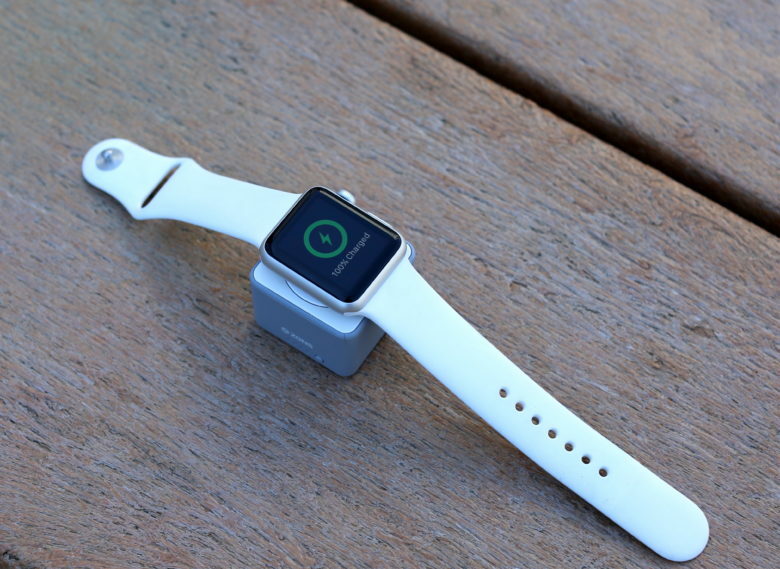 Zens Apple Watch Powerbank is one of the only chargers with its own built-in magnetic power adapter. So no more tangle-prone charging cable. 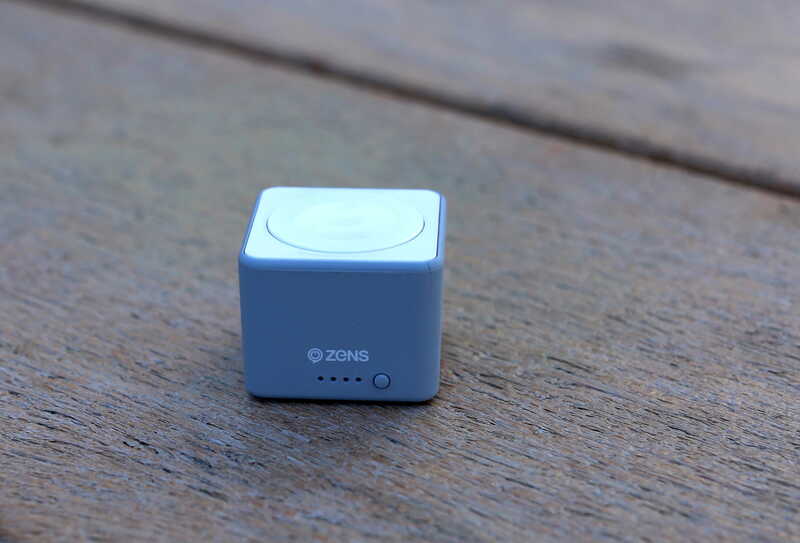 Made by a Dutch startup called Zens, the Power Bank is small and portable. Available in either grey or white, it measures just over an inch cubed. It’s too bulky for skinny jeans, but is easily tucked into a bag or jacket pocket. It’s certainly the smallest, lightest battery pack we’ve come across. Charging is activated by a small button on the side. Four LEDs display the available juice. The Power Bank itself is charged via a microUSB port on the other side. The Apple Watch charges when laid across the top, but the Power Bank works best if the watch band is closed around it. This keeps the watch firmly on the charger and allows it to be laid on its side for Nightstand mode. The Power Bank features a 1,300 mAh battery, which Zens claims is good for up to three full charges. It’s only 500 mAh short of the Nomad Pod Pro, which is rated at 1,800 mAh and is much bulkier. In testing, we got two-and-a-half charges using a 38mm Apple Watch, and two full charges with a 42mm Apple Watch, which has a slightly bigger battery. That’s plenty for short trips or a long weekend. I took it on a four–day camping trip and it kept my Apple Watch alive the whole time I was away. Zens’ Apple Watch Powerbank is good for at least two full charges. The Powerbank offers passthrough charging, so it can be a full-time charging station. I have it on my desk at work. I charge my Apple Watch during the day, and it’s always charged up and ready for a trip. The Powerbank is assembled from Apple-certified parts, so it’s not cheap. It costs an eyebrow-raising $49.99, which is kinda pricey for such a small accessory. However, it’s well-made and unlikely to burst into flames on your bedside table or a transatlantic flight. You’re paying for quality. The Zens Powerbank is the most versatile and handy charger for the Apple Watch I’ve used. It’s the best travel charger I’ve come across so far. Price: $49.99 with free shipping! Check out the Cult of Mac Watch Store for a huge variety of curated straps, chargers and accessories for Apple Watch. Zens provided Cult of Mac with a review unit for this article. See Cult of Mac’s reviews policy; and check out more stuff we recommend in our Best List reviews.